I have the draft completion line in sight, targeted, and I’m ready to break the ribbon. Four more new short stories to write, and several to take to a revised level. At this pace I should definately be completed by the end of next week for sure, this week if I am lucky. I want to then give it a couple of week’s break before going in for another edit (mainly cutting words, because I’m good at length). Then onto the – shiver – beta readers. Thanks for the one volunteer so far, if you want to help me out, please feel free to come forward also. I’m looking at July for a start, but am flexible to your own commitments elsewhere, like – oh, say, a book release! Today I won’t be writing so much – my morning has so far been taken up with cleaning up an old laptop for our daughter. It’s on Windows XP – remember that? And of course, all the security, browsers, plugins were out of date, and several million (it seems) documents need to be deleted, or archived over. Ah, memories. Anyway, hours later, and I’m still at it, dancing between two laptops, Dropbox, zip files, updates and memories. The writing work has impacted my reading goals. I’ve slowed down big time, hampered also by the weather – rain is not conductive to sitting out in the sunshine with a good book, oddly. But – ROW80 goals look likely a success for this month (and the end of the second quarter of ROW80). I’ll think about new goals for July. Yeah, will probably win it. I estimate another five thousand words on first draft, which will take me up to the 50,000 mark, just (I’ve deducted 20,000 words off the above wordcount figure to allow for correct progress). Camp-wise – it’s not much fun. Out of my five other camp mates assigned to the same camp, two never even started their work, two others have petered out, and another is limping along. One is a school aged writer, whose mother keeps stopping her from writing because of homework and domestic work, according to her status updates. The whole thing is a little depressing. I’m contemplating not doing August’s Camp, and saving that new work for Novembers’ full on NaNoWriMo, giving me some time to both work on my novel in progress, some cover art, perhaps some submission attempts (never know) and planning prep for that November novel (probably Blue Popcorn). My catchup post of yesterday was quite popular, thanks guys. 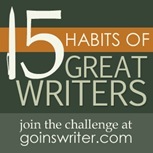 Jeff Goins asks us to steal something to inspire us to go on. He points out that there is very little originality in the world nowadays, but ideas taken from elsewhere can inspire us to create something of our own. I like the idea, but at the moment am struggling with not having an original concept. The huge amount of indie authors and otherwise sitting on my head as a debut writer is a little intimidating, and with the publishing industry so much in transit nowadays, we’re often told to come up with a new thing to grab attention with. I believe Blue Daisies, my first e-shorts collection, as part of a series, is slightly original, but then I look forward and realise the rest I have in mind are “just” novels. And I like novels. And I don’t necessarily want to go down the route of incorporating multi-media or something else whizbang when I simply want to tell a story. So this time around, I want to concentrate on just getting the work down, and completed. I don’t need fresh inspiration, I’m not at that point in my writing, I just need to get on with it. Okay, enough. Time to walk back to the old laptop and curse the fact I can’t get a large zipped file transferred over. Congrats on making such great progress with your goals! 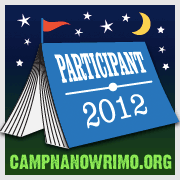 I joined Camped Nanowrimo, but never received any info about my tent mates. I don’t think I was assigned any! 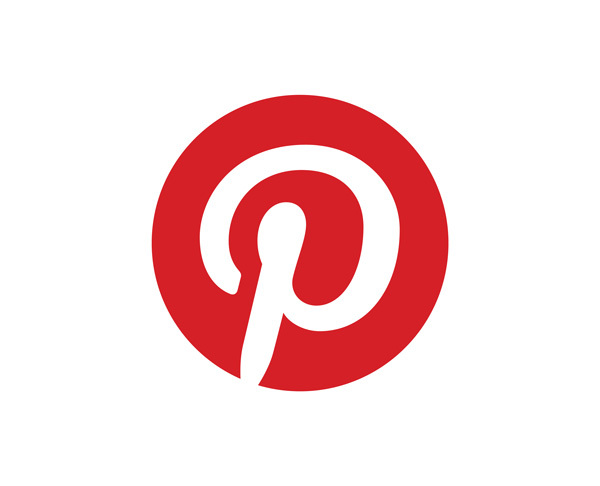 I’m off to check out the Jeff Goins link – sounds interesting.